라고 명령을 입력해도, X-windows는 실행이 되지 않을 것입니다. VMware를 설치해야만X-windows를 볼 수 있습니다. ▶VMware내에서 X-windows위한 Xconfigurato는 필요하지 않습니다. 그러니 괜한 시간 낭비하지 마세요. Xconfigurator을 실행해서 VGA와 Monitor를 설정해도 X-windows는 뜨질 않습니다. VMware Tools 를 설치해야 한다는걸 명심하세요.자, 그럼 VMware Tools가 무언지 한번 살펴볼까요? VMware Workstation Help의 VMware Tools에 대한 간단한 소개글을 봅시다. VMware Workstation installs unmodified operating systems directly from floppies and/or CD-ROMs. This installation process is the first and only necessary step in building a virtual machine However, VMware highly recommends that you install the VMware Tools suite within each virtual machine as soon as it is installed. It is very important that you install VMware Tools in the guest operating system. If you do not install VMware Tools, the graphics environment within the virtual machine is limited to VGA-mode graphics (640x480, 15 colors). With the VMware Tools SVGA driver installed, Workstation supports up to 32-bit displays and high display resolution with significantly faster overall graphics performance . Other tools in the package make it more convenient to use your virtual machine. The VMware Tools suite consists of two components: A graphics driver that is optimized for the Workstation virtual graphics card. For Linux guest operating systems, this consists of our own version of the XFree86 X server. The graphics driver is installed by the wizard. Once installed, it will be used for subsequent reboots. A small background application that allows you to change configuration settings within the virtual machine. Workstation controls the cursor settings and the connection state of removable devices, such as floppy and CD-ROM drives. 중간 부분을 보면, VMware Tools를 설치해야, 고해상도의 표현이 가능하다고 나오죠? 나머지도 참고로 읽어보세요. (찾아보기 귀찮으신 분들을 위해 올립니다..
그럼 VMware Tools설치를 위한 단계를 하나 하나 따라해 보세요. 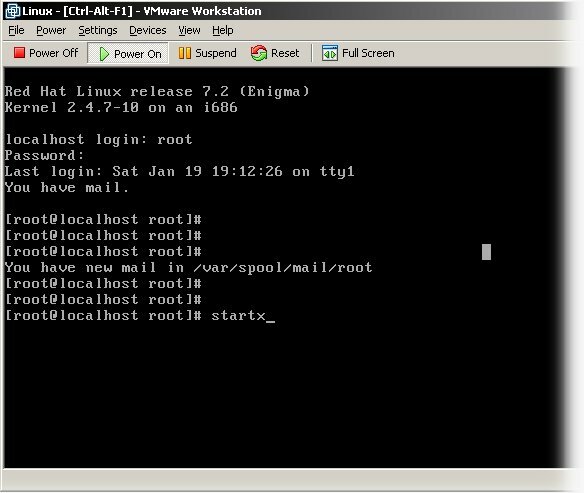 ※ 레코딩할때, VMware Workstation과 VMware Tools(for Linux, Windows)는 함께 하세요. VMware Tools 파일의 위치는 최상위 폴더로 하시고 레코딩 해주세요. 압축은 풀지 말고 받은 파일그대로. 자! 이제 준비가 되었으면, VMware Tools를 설치해 봅시다. 설치하기 위한 첫번째 단계로 VMware 의 주메뉴에서 ' VMware Tools Install...'을 선택합니다. ※ 선택을 하면 창이 뜨면서 Cancel, Install 등 질문을 해옵니다. Install을 클릭합니다. Install을 선택해도 화면상에서 달라지는 것은 없습니다. 되었으면 CD-ROM에서 VMware Tools 를 리눅스파티션으로 copy 합니다..
# cp /mnt/vmware-linux-tools.tar.gz /tmp :/tmp 라는 곳으로 vmware-linux-tools.tar.gz를 copy. copy가 완료되었으면 다시 CD-ROM을 unmount 시켜주세요. # tar zxf vmware-linux-tools.tar.gz /tmp 디렉토리에 압축이 풀리게 됩니다. 이제 Install을 합니다. 이때, 반드시 ' ./ '을 합께 입력합니다. 물론 PATH에 설정이 되어있다면 안해도 됨. 이제 설치를 하면서 두번 질문을 받게 됩니다. 그때는 yes 라고 답해주세요. 즉, yes 라고 입력한 후 엔터치세요. 설치가 완료되면 ' ........ Complete' 라는 텍스트를 보게 될 것입니다. 그런다음 startx라고 입력한 후, 엔터를 치면 X-windows 를 보게 될 것입니다. Linux를 종료할 때는, 를 하지 말고..
하면, VMware안의 Linux System이 종료되고, 창이 종료됩니다. ※ 혹시 MS IntelliMouse Optical(USB)를 사용하시는 분은 마우스 설정을 USB가 아닌 PS/2 타입으로 설정해 주세요. 그렇지 않으면 X-windows가 실행되지 않을 수 있습니다. 제가 지금 MS IntelliMouse Optical(USB)를 사용중인데, USB 로 설정을 했더니 X-windows가 안뜨더군요. 참고하세요. ※ 더욱 쉽게 설명된 그림책버전(^^;)이 "[2부] VMware에서의 Linux(Redhat7.2)설치에서 X-Window까지!" 글에 설명되어 있습니다. 참고하세요. 감사합니다. 헤매고 있었는데 여기와서 다 풀고 가네요..
vmware-tools cd는 만들지 않아도 됩니다 링크된 vmware-tools 는 1.x 버전의 것이고 2.x이후에는 vmware에 포함되어 있습니다. 3.2에서는 "설치폴더VMwareVMware WorkstationPrograms" 안에 linux.iso파일로 있더군요. 한참 찾았습니다. 하는 겨울의 날들 입니다. 다름이 아니라 염치 불문 하고 하나 여쭈어 볼것이 있어 글을 올립니다. 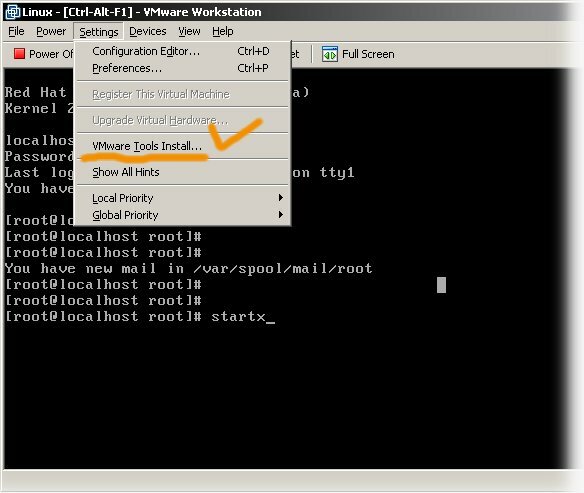 Vmware 메뉴 서브 항목에서 tool을 인스톨합니다. cp 명령을 이용해서 root디렉토리에다 복사. ip 포워딩 시킵니다....telnet 23, ftp 21, http 80 포트니깐 설정하시면 됩니다. 길죽한 폰트, 이게 어케 된것인지여??? 이리저리 넘어가서 설정할수도 없네요... 이것도 혹시 아시는분?? 그럼 부탁드립니다..
vmware 4.0.5 를 설치 했는데 tools 는 어디서 구하는 건가요? tools 파일은 설치된 폴더에 들어있습니다. 저는 4.5.2를 쓰고 있습니다. X-window 띄우는데는 성공을 했습니다. 저는 setup 를 들어가서. Xcon~~뭐시기.. 에서.. 설정해야 되는줄 알았는데.. vmware-tools 설치하고 Install 하니깐. 마지막에 해상도 선택하는 것이 나오더라구요 선택하고. startx 실행.. 떴습니다... 기뻤습니다... 그런데..
제가.. RedHat linux 7.1k 거든요.... 한글이.. 깨져서 나옵니다... 이거.. 해결방법좀 알수 있을까요.. 설치시 한글을 선택 했죠... 그럼..